PRESS RELEASE: Gaslamp Popcorn Partners with Susan G. Komen! As you may know, we have reviewed several products from Gaslamp Popcorn in the past. 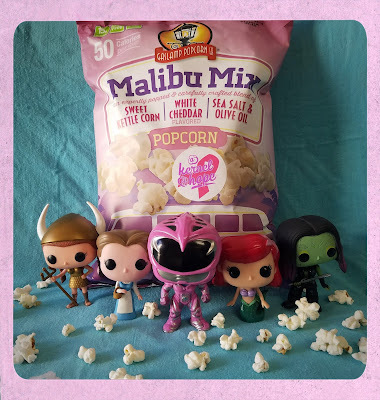 We absolutely loved their popcorn, and we were thrilled to hear they have partnered with Susan G. Komen®. This year, Gaslamp Popcorn will be sampling their products at Susan G. Komen-hosted events throughout California and areas of Nevada and Texas. From the company, "the brand’s responsibility to the community aligns well with Susan G. Komen’s commitment to furthering the research toward finding a cure for breast cancer, and consciously crafted Malibu Mix is the ideal way to help amplify the message." A generous donation of 100,000 bags will be bestowed to event attendees and participants at local Race for the Cure® events, 3-Day walks, mammography events and more. It is so awesome to see a company from the Gaslamp District coming together to help do its part in advancing breast cancer research and spreading awareness in the community their delicious gluten-free snack, which is almost made with non-GMO corn and pure cane sugar. Please be sure to check out Gaslamp Popcorn all over the internet!